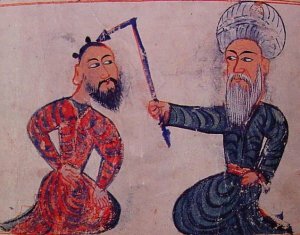 Image taken from the first medical textbook "Cerrahiyyet'ül Haniyye", written in Ottoman languageby the Turkish surgeon Serafettin Sabuncuoglu. From the Ancient World to the Middle Ages, cauterisations were also used in the treatment of epilepsy. We thank Professor Cigdem Ozkara (Istanbul) for providing us this picture.